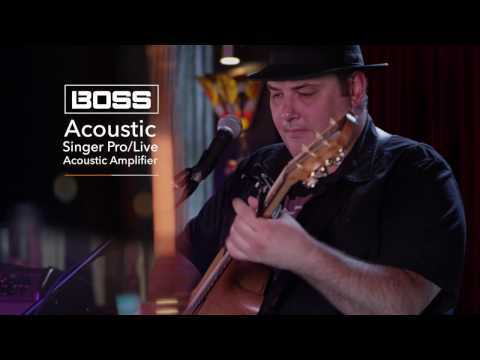 The BOSS Acoustic Singer Live Acoustic Amplifier is the ideal choice for those who are seeking a professional quality amp for gigging and recording with, and accommodates both guitar and vocal duties. The selection of signal routing options on offer, tone sculpting capabilities afforded, and built-in effects to play with - not to mention vocal harmonising and looping - is simply mind blowing for this portable beauty. Whether you like to go it alone, perform as part of a duo or ensemble, the Acoustic Singer Live from BOSS enables you to do it all, and do it in style. The BOSS Acoustic Singer Live is endowed with BOSS' newly designed bi-amp speaker system, which amplifies the custom-designed 6.5-inch woofer and domed tweeter separately. The advantage of this is that no matter what volume level you're performing at, the transient response is handled deftly to guarantee a delightfully smooth response. By using innovative materials in the production of the speaker components, the system all works with the precision we've all come to expect from the team at BOSS. The unique cabinet construction method removes unwanted resonances, whilst the integrated tilt-back design affords maximum sound projection to your audience. To exploit the power of the bi-amp design fully, guitars have been given an exclusive channel, whilst an independent mic channel allows you to introduce a vocal/guitar microphone or second instrument source. The guitar channel features a discrete analogue input circuit that is designed with increased headroom to generously accommodate the wide dynamic range of your acoustic. With BOSS' built-in Acoustic Resonance control, the stark clarity created by the guitar's piezo pickup is reintroduced to the timbre and warmth that is heard when the guitar is played unplugged. The guitar channel is also equipped with a three-band EQ to sculpt your tone, as well as a phase switch and notch control for minimising feedback issues. There are also dedicated BOSS chorus effects and a guitar-optimised reverb that allows you to finesse and fine tune your sound. The mic channel has an additional phantom power switch for including studio-grade condenser microphone. The three-band EQ, phase switch and anti-feedback notch control are also present. However, the mic channel is equipped with a delay/echo effect, as well as a reverb to give your vocals that sparkling articulation they deserve. If you don't wish to perform vocals, the mic channel can also be used to provide an additional channel to mic up your acoustic guitar with, blending two amplification sources together for a fuller output. The Acoustic Singer Live has an integrated vocal harmony function, which knits together beautiful live harmonies whilst you sing and play guitar. The delightfully simple process in carried out by exceptionally clever BOSS circuitry, which analyses the chord progression from your guitar input in real-time, and marries your vocals to the corresponding information. Not only that, but if you change key, the processor reacts and makes the necessary attenuation without you having to change a thing. There are two harmony types to select from, as well as a unison setting to give your performance greater impact. The built-in looper allows you to weave together complex layers of guitar, vocals and effect to give you complete creative control over your live performances. The rear panel of the amplifier features a selection of connectivity options for you to utilise. With dual DI/Line outputs provided on XLR connectors, with mode switches for outputting both channels simultaneously/independently/direct or post-effects. The aux input with level control, allows an external sound source such as a mobile device to introduce a backing track to perform to. The USB jack allows your performances to be recorded directly to a computer and your DAW of choice. A Rec/Phones jack gives affords the option to practise in silence or record to a portable device. By employing optional footswitches, you can readily make adjustments on the fly with regard to the harmony function, looper, effects, and much more. The BOSS Acoustic Singer Live Acoustic Amplifier is supplied with an owner's manual and power cord to get you up and running. As you can see, it is an exceptional model that gives you everything need to take to the stage and wow your adoring fans.